Ledfords Landing is a picturesque lakefront retreat in a private setting. This 2600 sq foot lakefront home is spread over two floors. Upper and lower decks boast of views across the lake to Chimney Rock. The main level has a large great room with ample seating that surrounds a lovely brick fireplace. The kitchen/dining area is spacious and opens into the great room. The upper level has 4 bedrooms - 3 of which have a sliding glass door that opens onto a common covered balcony facing the lakefront. The master bedroom on the lakefront has a king bed and its own full bath. The other three upstairs bedrooms share a full bath in the hallway. All of the bedrooms are roomy and comfortable. The two lakeside bedrooms have queen beds. The fourth bedroom has two twins. For additional sleeping space there is a 5th bedroom with a queen bed that is located just off the kitchen. There is also a full bath with shower downstairs, which is also accessible from the outside, great for a quick rinse off after swimming. The large covered porch/deck located off the great room provides a great spot to read a book or enjoy the lovely views of the lake and mountains. If it’s a water experience you are interested in, there are only 20 steps from the house deck to the lakefront over-sized dock with shaded area and ceiling fan. Whether canoeing, kayaking, swimming or just floating aimlessly in the cool emerald water, you’ll be at ease as we are situated in a quiet “no wake” cove. (We provide 2 sea otter kayaks and canoe for your use.) No matter how you spend your day, you’ll want to be on the 'rooftop deck' over the boathouse in the evening. The water changes from cool green to brilliant gold as the sun sinks over the mountain. At Ledfords Landing, you have a beautiful view directly across the lake to the mountains. It is a great way to get see the lake and surrounding area; go for a sunset cruise, go to Bayfront Grille by boat for lunch or dinner. There are several (14) acres adjacent to the house that are perfect for playing baseball or Frisbee, picnicking, or star gazing at night. It was on this property that several scenes from the movie Firestarter were filmed. Please note that our home is family friendly. We welcome you to use some items we've kept for your convenience - portable crib/high chair/booster seat. Also an ample supply of toys, books and videos. The porch has locking gates to help keep little ones safe and let you relax. We love animals, but for the comfort of all our guests, we do not allow pets. Visit our on-line guestbook for comments from some of our special guests. I grew up in Asheville. My father and mother both from small NC mountain towns. My father (jenny talking) purchased 14 acres at the head of Sunset Cove on Lake Lure in 1963. I grew up coming to Lake Lure and Papa Bob's Cabin (VRBO#34359). In 1988, my family purchased this house. It sits adjacent to the original property. We have countless precious family memories here. We rent our home for 2 reasons: we can't use it all the time and want to share it with other families to create special memories of their own. The rental income allows us to keep the house and property up to date and well maintained. Each year we try to upgrade the house or property is some way to honor Papa Bob and all he has done to allow his family such a wonderful place to call our own. Our home was purchased in 1988. There are countless precious family memories here. We welcome you to come and enjoy our home and the lake with its beauty and peacefulness and make your own sweet memories. Not many homes on Lake Lure possess the combination of a level lot, ample space outside to play, and proximity to the water. We are 20 steps from deck to dock. We have a westerly view and the nightly sunsets are amazing from the rooftop deck. We have privacy as well as access to lots of room to play as the house sit next to my family's 14 acres. There is a spot by the water for an old fashion bonfire. There is a field for star gazing and for games. Our home is on a no wake cove so you can float or play without worry of boat traffic zooming by. With both properties: Ledford's Landing and Papa Bob's Cabin, we can sleep 16. We had an excellent time at Ledford’s Landing. The house is clean and beautiful and the location on the lake can’t be beat. We didn’t have the best weather unfortunately but Tom and Jenny worked with us to get some extra time with sunny weather on our last day. They were extremely accommodating and we really couldn’t have asked for more. We highly recommend staying with them and we will do so again in the future. Perfect location, perfect house layout, perfect vacation! Our family vacation at Ledford's Landing was wonderful! The layout of the house was perfect for our family with an open floor plan downstairs and nice sized bedrooms. The house is located at the very end of Sunset Cove.The location on the lake was perfect with a view the mountains, Chimney Rock and a beautiful sunset every night from the deck on the top of the dock house. We enjoyed the lower dock for swimming and relaxing in the sun or shade. One the perks of Ledford's Landing is the additional outdoor space. We played corn hole in the long driveway and spike ball and bocci ball in the field at the end of the cove. We were glad that we decided to rent the pontoon boat. We enjoyed a few sunsets from the middle of the lake from the boat as well. Tom and Jenny Cox were very helpful and easy to reach to answer questions prior to our arrival. 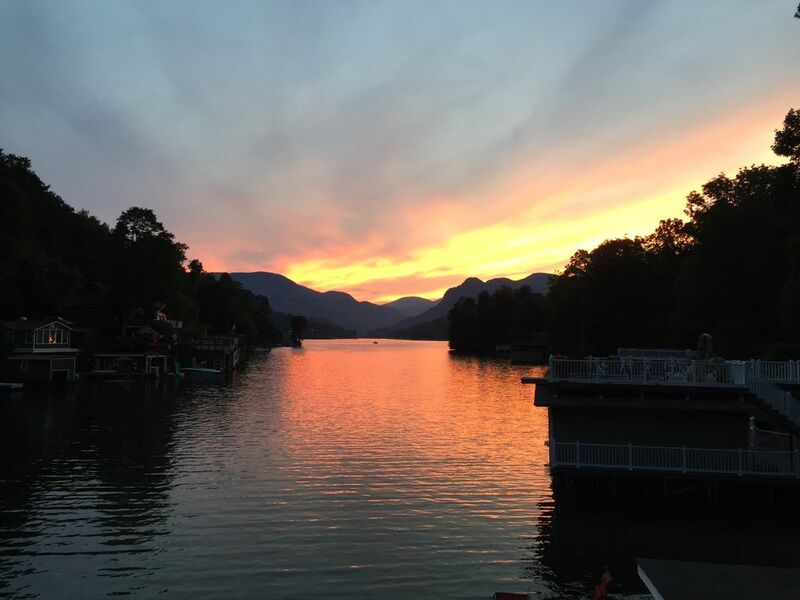 We highly recommend Ledford's Landing at Lake Lure! We know that vacation time and family time are precious. We want our guests to be comfortable, soak in the beauty of nature, and enjoy their time away with family and friends. After 18 years in this business, we have many return guests each year and this is the best compliment we can receive. When we have a new guest, such as this one, that comes for a visit, feels at home and leaves with sweet memories and having had tons of fun, we have hit the mark we strive to hit. This place was exactly what we were looking for; clean, private, great views, and right on the lake. The downstairs is wide open making it possible for several things going on at once: ping pong, foosball, cards, conversation...all in one big room. Candlelight sunset dinners were great on the deck over the lake with plenty of room at the table for everyone. We usually cooked in pairs, and the kitchen was a great size for that; no bumping into one another. The bedroom situation was perfect with 4 upstairs and 1 downstairs with one being a master with a big shower! Two other bathrooms with showers as well. Never had to wait on each other. We definitely want to come back next year. This is a perfect place to stay. The house was perfect for our family! We had kids ranging from 2-8 yrs old and the foosball table, amazing deck(s), canoe, life jackets of all sizes and little water slide kept everyone busy and happy for the week! The only drawback is that you need to bring your own towels. Some of our family lives in Asheville, so not a problem for us generally. We will definitely go back next time we head to NC! We have stayed at Ledfords Landing several times and it is always a wonderful time. The home is clean and comfortable! Everyone had a blast on the kayaks/canoe. Plenty of outdoor space to relax and enjoy the view. The sunsets are simply spectular!! Can't wait until next time. Rates are subject to change and multiple day discounts and weekday discounts are negotiable. Please contact us. Rates include sheets and cleaning. 3 day minimum for holidays. 24ft pontoon boat available!! weekend rate $295, $195/day for 3+ days , $1150 weekly. Tax will be added.